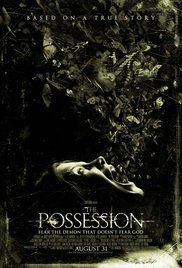 In contrast to the promising start of “The Possession“, the end of this Jewish variation on the “possession” theme is quite laughable. It wouldn’t surprise me if there’ll be a comic “Scary Movie” version of it in the near future with a dancing rabbi in it. But despite that this is another variation on the famous movie “The Exorcist“, I thought it was an enjoyable film that had its good moments. If only the whole film would be as strong as the opening scene, this would have been undoubtedly a great movie. We see an old woman who owns the cursed wooden box and wants to destroy it, after which she’s unmercifully tucked double, spun around and left behind lifeless.The yard sale the descendants of this woman organize is to pay taxes as they say, but it seems to me they need it to finance the medical expenses. It’s there that Clyde (Jeffrey Dean Morgan) and his two daughters Emily (Natasha Calis) and Hannah (Madison Davenport) accidentally end up, because Clyde needs more dinner plates. Emily discovers the old wooden box and is immediately fascinated. The box is filled with Hebrew inscriptions and later turns out to contain a dibbuk. A dibbuk according to the Yiddish mythology is the soul of a deceased person who has returned from hell and wants to take over the soul of a living person. The box turns out to be sealed when Clyde examines it with his daughter. Yet Emily manages to open the box overnight. It houses a number of ancient artifacts like an old tooth, a dead moth, a wooden figure and a ring that Emily starts wearing immediately. From this moment on Emily begins to change into an introverted girl with a true obsession for the box. The second facet of this film is the family part. Clyde has only recently left his wife Stephanie (Kira Sedgwick) as the two grew apart and also because Clyde had more passion for his basketball coaching than for his wife. Meanwhile Stephanie started a relationship with the perfect man and dentist Brett (Grant Show) and the two daughters stay alternately with the two parents. This part of the film is painfully cheesy. For me this was more horror than the part with the dibbuk. You can see it coming that those two separated people still have feelings for each other, and when the end approaches, they will come together again. The irresistible dentist disappears somewhere in the movie unexplained. The relationship between the tooth in the box and the dentist probably is a coincidence. The film is packed with cliches from previous films of this genre. However, there are a few reasonably successful moments like the moment that Emily looks in her throat with a flashlight, the slow metamorphosis she undergoes, the violent attacks against the old woman and teacher, and the scan. There are also a few ridiculous moments. Especially when Emily plants her fork in the hand of Clyde who responds to that laconically with a dead calm “Go to your room.” A true example of self-control. And the cliches mentioned earlier are also abundant. The slamming doors, the stroboscopic lights, the distorted voice, the fact that the demon uses a weakened family situation to possess someone, the desperate cry of the father to take him and the most obvious easy solution to take the film to a higher level of suspense is the use of the words “Based on a true story”. The acting by Natasha Calis is the only noteworthy in this film. The rest goes from meaningless to uninspired. Jeffrey Dean Morgan plays a typical role as the protective father who scurries to the Jewish quarter for advice and help. For the rest, he goes through the mandatory palette of a caring father to a falsely accused father with despair on his face. Kyra Sedgwick plays the transverse and probably emotionally hurt and lonely feeling woman who probably has taken the perfect dentist in her house to hurt her basketball loving ex-husband. For the rest, her contribution is negligible. Madison Davenport is the elder daughter. That’s it. Her only action-packed portion is the hysterical screams during the moth infestation. The most colorful figure perhaps is Matisyahu (The Hasidic Reggae Superstar) who plays the Jewish son Tzadok, who feels obliged to help this family to get rid of the dibbuk. This Hebrew-American reggae singer did his ultimate best during the closing ceremony and defeated every exorcism, ever shown in a horror, easily in points. “The Possession” isn’t really creepy. There are no gory scenes and the frights are tremendously scarce. But it’s fun to watch and the entertainment level is very high. If you momentarily forget about the cliches and you ignore the obvious open end, you can really enjoy this film. Nothing groundbreaking or original, but after a film like “Cruel Will” you surely can appreciate this film.